Growing up, I never really read comic books, but I did enjoy 2 superhero shows. Super Friends and Fantastic Four. I can’t stress enough how ridiculous the backlash has been for this film. I made the mistake of accidentally catching the review consensus this time before watching it–something I absolutely hate doing. But I did, and therefore spent the entirety of the film expecting it to be terrible. It’s no Godfather, but it’s not The Last Airbender either. This movie is entertaining, riveting, visually stunning, and far more inventive with its origin than the previous series. With a much darker take on the classic comic book series, director Josh Trank has us immersed in a world that’s already somewhat dystopian. High school genius, Reed Richards (Miles Teller), gets recruited to a team who is developing a machine that can teleport organic matter to an alternate world. He, along with Sue (Kate Mara) and Johnny Storm (Michael B. Jordan), Ben Grimm (Jamie Bell), and Victor Von Doom (Toby Kebbell), gets super powers from the energy contrived by this mysterious world. As filmgoers, we tend to take each adaptation of a film as the definitive version. This doesn’t happen in literature. While Frank Miller did catch some flak for darkening Batman in his Dark Knight Returns graphic novels, overall the feedback was positive and today he is credited by many for revamping the series. This new Fantastic Four isn’t perfect by any means. The dialogue is shoddy, the setup takes up 2/3 of the film, and there isn’t enough action to satisfy a room full of Comic-Con attendees, but I couldn’t stop watching. The first 45 minutes or so feature some of the best cinema I’ve seen all year–full of mystery and intrigue. 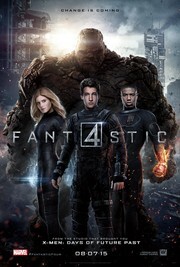 While I grew up with the cartoon version of the Fantastic Four, I have an appreciation for the dismal tone of this film. It’s something new and edgy. I did feel, however, that the direction is a little sloppy. As much as I love Miles Teller, I feel like I’m watching some of his bad takes rather than a final cut. Also, there is no purpose for using a CGI monkey over a real one. But overall, I would watch this film again. It has one of the best Marvel movie villains to date. And although most of this film is a setup, it takes one for the team and provides a solid foundation for future films in this series.